Craig Spisak, Director of Acquisition Career Management (DACM), has officially appointed Joan Sable as the Deputy DACM. In that role, Sable will act on behalf of the DACM as necessary when working with the Office of the Undersecretary of Defense for Acquisition and Sustainment regarding human capital initiatives. Her primary focus will be on the Army Acquisition Workforce (AAW) Human Capital Strategic Plan, and AAW policies and procedures. See the appointment memo at https://asc.army.mil/web/alt-workforce-policy-procedure/. Direct hiring authorities (DHA) and expedited hiring authorities (EHA) have made a huge impact on decreasing the time it takes to hire AAW professionals. In 2018, the Army filled more than 1,589 acquisition positions using DHA and EHA. Of the people hired to fill those positions, 1,299 were new to the AAW. In some of the more critical areas, such as Engineering and Cost Analysis, Army acquisition filled 499 and 121 new positions respectively. The requirements under traditional authorities, such as applying veteran’s preference, aren’t as restrictive when using DHA or EHA. See more details on these valuable hiring tools in the January DACM News . Check out our January DACM News at https://asc.army.mil/web/dacm-newsletter/. Congratulations to the following AAW civilians on being selected for the FY20 colonel/GS-15 project manager and lieutenant colonel/GS-14 product manager Centralized Selection List (CSL) – Command and Acquisition Key Billet positions. The official FY20 CSL results for both civilian and military selectees are posted on HRC’s website. What makes civilians competitive for selection among their military peers? The selection board considers an individual’s complete body of work, which for civilians includes their Acquisition Career Record Brief, resume and the Senior Rater Potential Evaluation (SRPE). The SRPE is the civilian’s equivalent of the Officer Evaluation Report, and it’s important to build a strong SRPE. Click here to learn some more insider tips on how to do just that. These FY20 civilian principal selectees will serve as acquisition project and product managers beginning in the spring or summer of 2020, and will run major contract efforts and lead Acquisition Category I, II and III weapon systems programs within designated PEOs or acquisition commands. See more information on the FY20 CSL Board here. 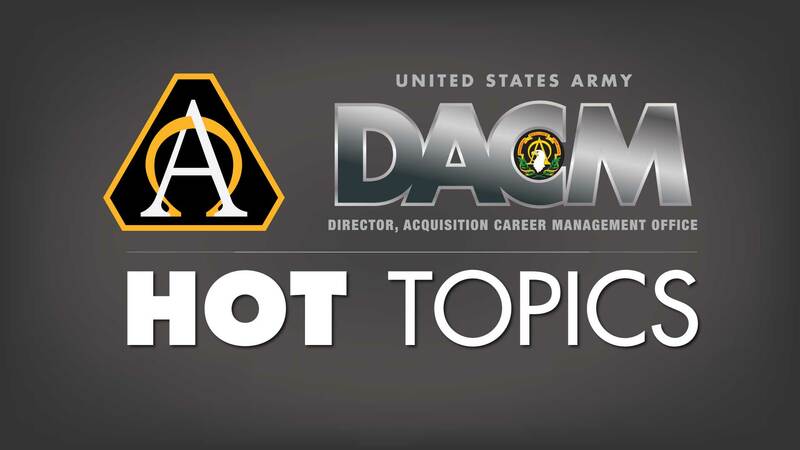 Is there someone you’d like to highlight in the Army AL&T Faces of the Force feature or DACM’s Spotlight on Success? Email us at DACM Outreach. Who wouldn’t like some help paying for the cost of higher education? The Student Loan Repayment Program is designed to repay federally insured student loans for civilian acquisition professionals, and opened for applicants Jan. 14, 2019. Take advantage of this valuable program at https://asc.army.mil/web/career-development/programs/student-loan-repayment-program/. The Defense Civilian Emerging Leader Program (DCELP) is now open for applications. DCELP develops emerging leaders at the GS-07 to GS-12 or equivalent levels and prepares them for further development as leadership responsibilities increase. The program includes residential courses in team development, effective writing, conflict resolution and more! Applications accepted through March 28, 2019. 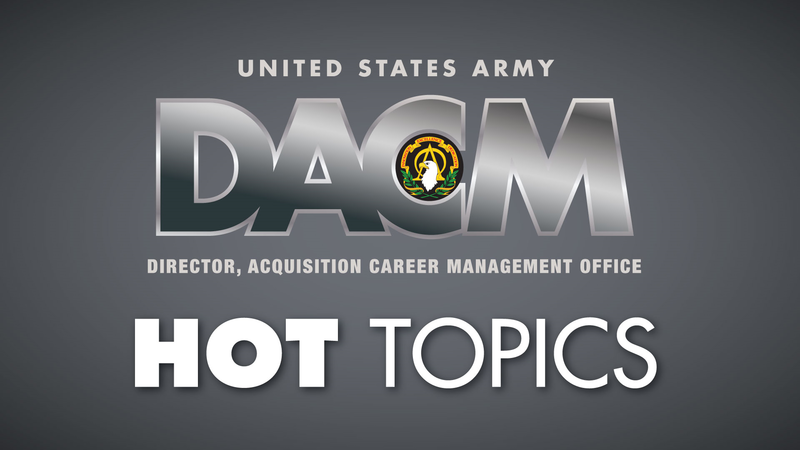 See all the details at https://asc.army.mil/web/career-development/programs/dcelp/. The Defense Acquisition University Senior Service College Fellowship is open for applicants until March 29, 2019. This valuable 10-month program prepares students for leadership roles such as product and project manager, program executive officer and other key acquisition leadership positions. See details at https://asc.army.mil/web/career-development/programs/defense-acquisition-university-senior-service-college/. Applications for Q3 FY19 Acquisition Leadership Challenge Program (ALCP) enrollment are being accepted February 1 – 28. This leadership development seminar, offered at three different levels, is designed to establish a foundation of self‐awareness and to assist in the overall “leadership and diversity” development within organizations. ALCP offers sessions for all civilian AAW professionals: ALCP B is for GS‐7 – GS‐11 or equivalent; ALCP I is for GS‐12/13 or equivalent; ALCP II is for GS‐14/15 or equivalent; and ALCP III is for GS-14/15 or equivalent and members of the Senior Executive Service. Find out more about this exciting, career-enriching program at https://asc.army.mil/web/career-development/programs/acquisition-leadership-challenge-program/. NPS Systems and Program Management Non-Resident Master’s Degree Program. This interdisciplinary program offers a non-resident option for qualified GS-11 to GS-15 (and broadband equivalent) AAW professionals to broaden their technical capabilities in order to successfully lead initiatives in support of the defense acquisition system. Find more information at https://asc.army.mil/web/career-development/programs/naval-postgraduate-school-master-of-science-in-program-management/. NPS Systems Engineering Non-Resident Master’s Degree Program with a System of Systems Focus. This program is designed for GS-11 to GS-15 (and broadband equivalent) AAW members with a baccalaureate degree in engineering or a related science or technical field. NPS educates and trains students with tools and technologies relevant to their work, resulting in acquisition professionals with greater knowledge and expertise to better meet the needs of their customers. Find more details at https://asc.army.mil/web/career-development/programs/naval-postgrad-ms-sys-eng/. Turn those innovative broadening and training ideas into a reality! The FY20 Army DACM Office Defense Acquisition Workforce Development Fund (DAWDF) data call for funding requests will open in mid-February 2019. DAWDF allows organizations to design quality initiatives to recruit, hire, train, develop, recognize and retain the AAW of the future. In alignment with the AAW Human Capital Strategic Plan, organizations are encouraged to submit quality requirements focused on the five strategic goals. There is a particular focus in FY20 on developing broadening assignments that provide future acquisition leaders with experience in science and technology, test and evaluation, materiel development and sustainment. 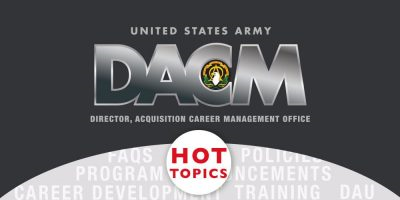 Talk with your command DAWDF POCs for more information, and check out program details on the Army DACM Office website at https://asc.army.mil/web/career-development/dawdf-program/. The length of the CON 170 course will be changed from 10 days to 8 days. As part of this change, CON 170 Class 031 in Richmond, Virginia (scheduled for April 1-12, 2019) will be cancelled and converted to the student pilot. CON 170 Student Pilot Class 951 will be added, with class dates of April 2-11, 2019. Students from Class 031 will be moved to Class 951 and notified. The eight-day version of the course is projected to be deployed in July 2019.